Canal fans from across Britain, and further afield, gave up their summer holidays to help restore part of Norfolk’s heritage. 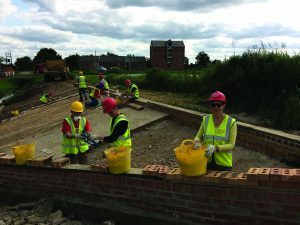 More than 30 volunteers took part in a Waterways Recovery Group (WRG) camp on part of the unique North Walsham and Dilham Canal. The waterway is Norfolk’s only sailing canal with locks. The workforce spent two weeks rebuilding the derelict spillway – or overflow – at Ebridge, just above the dilapidated lock. 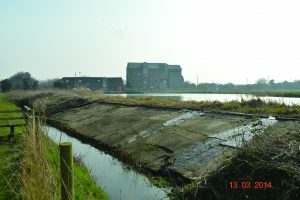 Once finished, the restored spillway will make it easier to control water levels along the 19th-century waterway, which fell into disrepair after the last wherry sailed it in 1934. The work at Ebridge, coupled with the newly-restored spillway 1.29 miles away at Royston and the almost-complete restoration of the lock at Bacton Wood Mill, means that it will soon be possible to water a dry section of the Canal, between Pigney’s Wood and Spa Common. The added section will mean that a 3.7km (2.3 mile) stretch of the canal, originally nearly nine miles long, will have been re-opened, thanks to supporters and canal owners, over the past 17 years. 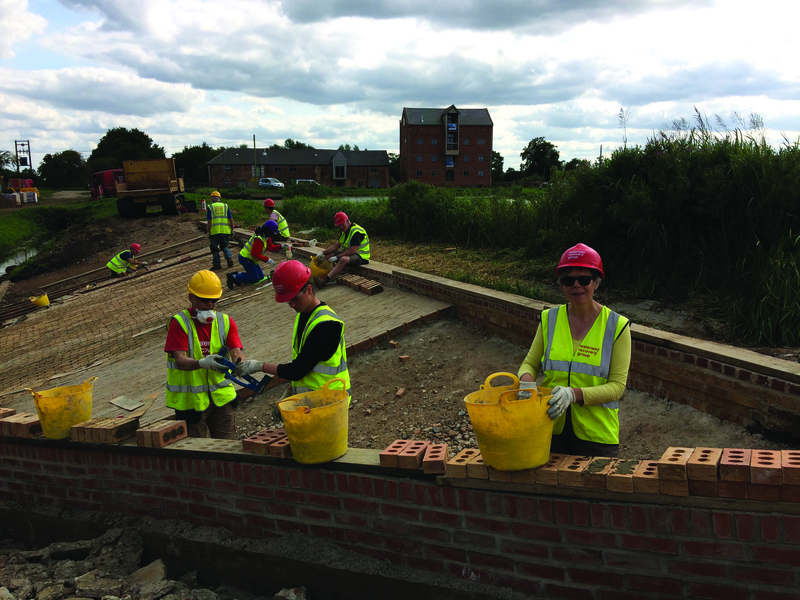 Work on the Royston spillway was carried out by volunteer work parties organised by the North Walsham and Dilham Canal Trust. They spent 851 hours over three months clearing, levelling and bricking the spillway, working at an angle of 45 degrees. A paid workforce on a basic wage would have earned about £6,000 in that time. Bob Crow, who led the second week, said they would complete about 60% of the work needed to finish the Ebridge spillway. Among the volunteers was Evelyne Laveaux who had travelled from her home in north-east France to help. “I am very much interested in conservation and restoration and I am a teacher of English in France so this allows me to combine both interests, and practise my English,” she said. The group stayed in North Walsham Scout Hut during their camp and fitted in trips to Norwich and Cromer. Other volunteers, who included young people completing their Duke of Edinburgh Gold awards, came from places including Cardiff, Lichfield, London, Sheffield and Lancaster. Bob, from Brightlingsea, said they had spent the first part of the camp ripping out concrete and bricks placed over the spillway as part of Second World War defences. The hardest job had been rolling the ground to compact it, working on a 30 degree incline. They had then reinstated the crest wall at the top of the structure and had finally worked on brick-facing the weir slope. 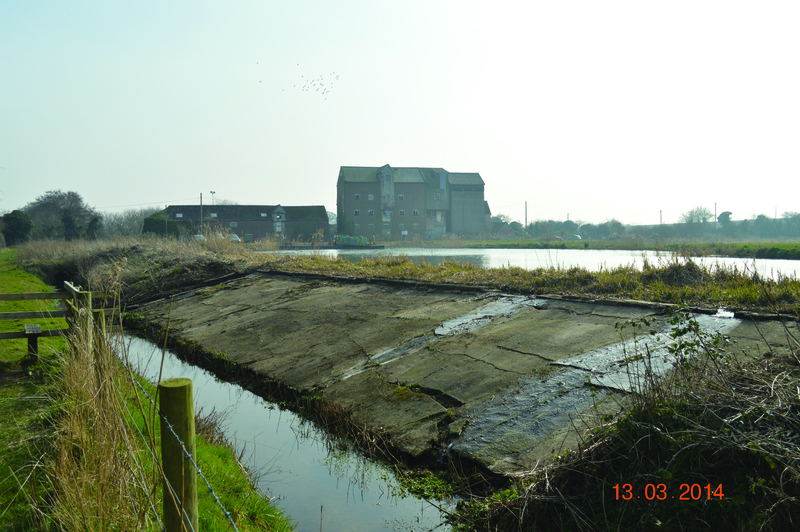 There will be a chance to learn all about the canal and its restoration on September 9 (11am-5pm) and September 10 (10am-4pm) when the trust takes part in the national Heritage Open Days. Visit Ebridge Mill pond (NR28 9NG for satnav users) for the chance to walk the 2.5 miles of canal path, or bring a canoe and take to the water. The trust will be offering trips on a work boat and volunteers will be on hand to talk about the work parties. and membership tent, refreshments, a tombola and bric-a-brac stall. This entry was posted in Home Page, North Walsham and tagged canal, Dilham, North Walsham, waterways, wherries on September 7, 2017 by Gay Webster.